Saw this great video from explore about the artform of Bharatanatyam which is one of the oldest dances originating from South India. This video from Explore is very informative and vibrantly colourful just like India herself. The signing and expressions reminded me of sign language. In Indian it’s not uncommon for girls to go to classical dance classes (a bit like young girls taking ballet classes in the UK) as it is supposed to help their deportment discipline and grace (hopefully for the fun too). I didn’t have lessons as a child as I flitted quite a bit between India and the Uk when I was a child and so missed out. I did have the opportunity to attend a one off lesson whilst at University when there was a visiting dancer of classical Indian dance. The precision and concentration required to even get the basics right was astounding and although I enjoyed the lesson immensely I was grateful I didn’t have my heart set on a career in dance as I would surely have starved. 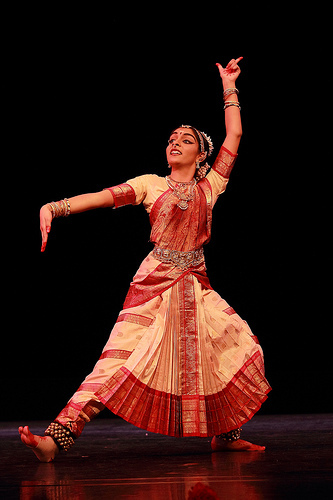 I definitely want to go and see a Bharatanatyam performance on my next trip to India.